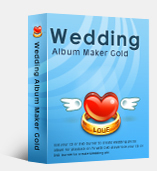 Wedding Album Maker Gold Version! The online ordering is 100% secure! All data exchanged during the payment process is SSL-secured. Our servers support SSL Version 3 and 168-bit Triple DES encryption, and the RSA module and SSL sessions feature 1024-bit encryption. We leave nothing to chance when it comes to security. Please make sure you are running the latest version of Wedding Album Maker. Otherwise please download and install the latest version by clicking [Download.html]. Run the program and click the menu "Help > Register" button. There will be a registration popup dialog. You may input the Name and Code manually. The registration name is case sensitive. And, please do not add blank at the beginning or the end of the word. You can also copy and paste the Name and Code into the registration popup dialog.